One of the most talked about "tools" to come out of AWFS was the Rockler Bench Cookies. 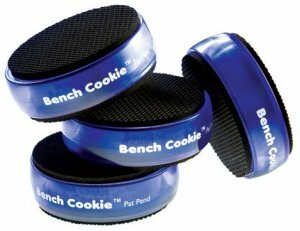 The Bench Cookies are Rockler's three dimensional version of the non-slip router mat. They bring your material off of the work table which allows for more routing possibilities, while the non slip grip keeps you safe. Now that the weekend is over, we are starting to see some of the first user reviews. So far the consensus is that the Bench Cookies are a keeper and you might even want more then one set. Ralph from ConsultingWoodworker.com does a good job of testing their gripping strength. Testing them even when covered with a ton of saw dust. However, the grip does depend on the weight of your material and light objects might cause you some troubles.